Is one of your New Years Resolutions to get organized? Office or home, a label maker is a convenient tool to help you stay organized. There are the typical uses… files, binders, folders etc. 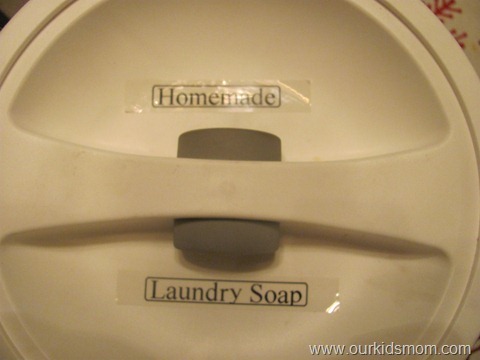 At home you can label containers used to divide products purchased in bulk at local “club” stores , label your children’s books, toys (great with multiple children with the same toy! ), chore charts… the uses are endless. The LabelManager 260P makes creating your labels simple and fun. My husband and I commented how we remember making labels on the old punch style where the label was bumpy (remember those?). Now you can type, change your mind, change the font style or size, save it, put a box around it, underline it, tell it to print 3 of that particular label and more. You will find it so easy you’ll be tempted to label your children, too (i.e. sleepy, cranky, lovey, messy…). I am attempting to simplify and organize our life. Below is a container I labeled with my homemade laundry soap inside. I foresee several containers of this type wearing a new label in my future! Take a peak at how easy it is to use! One OurKidsMom is going to win a Dymo LabelManager 260P! I’m a new follower and I would love to be entered for the Dymo give away! The Dymo Label Writer 450 is just what I need to save a few trips to the post office! I would love to be able to print my postage labels from home!!!! I friended you on GFC!! AND went to the website and love the idea of a digital label maker!! Would love to win!! I like the DYMO LabelWriter 450 Twin Turbo Dual Roll Label and Postage Printer for PC and Mac. I would love the Dymo label maker. I like the plug and print label maker on the Dymo Site. My husband could definitely use the Card Scan Executive for his business! I like the picture me postage stamps and I am a GFC follower. I would love to use the Picture It Postage option on their website! I like Dymo on Facebook! I posted on Twitter using your share the love button! I posted on google buzz!! i like the card scan executive! I love the DYMO by Pelouze 20 lb. Rate Downloadable Scale (PS20DL)! I’m a GFC follower. Wow! This company has everything. I can remember when those embossing label makers were the hottest thing around. We labeled EVERYTHING with one of those when I was a kid. These electronic ones are amazing. I love that they have rechargable batteries and a keyboard. Aren’t kids spoiled nowadays? If I win thins thing, I can assure you that everything from the front door to the TV will be labeled! follow with gfc. I like how many different options you have of font size, font type, and box style. All your labels don’t have to look identical. 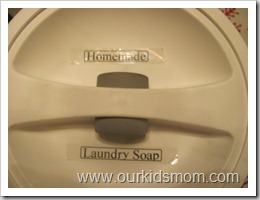 GFC follower and love that Dymo label makers are so easy to use! I would love to organize my house with this. Following via Google and I like the Caption Maker! Entered Thomas Wobbly Wheels and Whistles giveaway! Entered Microsoft Office 2010 RV giveaway! DYMO LetraTag® Plus LT-100T – Personal Label Maker. Thanks. I am a follower and just love the embossing label maker! I had no idea they had such cute colors and even one with baby feet on it! I use this labeler for scrapbookin and love it but could really use the other label maker for getting thngs organized in the garage! I like the CardScan Personal. I am following. I like the dymo cardscan executive. I follow on GFC. I totally love the DYMO LabelWriter 450 Turbo High-Speed Postage and Label Printer for PC and Mac–no more standing in line at the post office! following. I lust for a ptouch labeler, really. I had one of those clunky plastic labelers back in the day and I can;t believe how cool they have gotten! I really love the LabelWriter 4XL Label Printer, b/c it does barcodes! and I could totally use that for my small business! i follow you via gfc and i like the card scan…..my husband could so use one. I like Dymo on facebook. Also entered Charlie Brown dvd giveaway. Also entered tonka strong arm truck giveaway. Also entered $50 amazon gift card giveaway. I follow your blog and I’d like the DYMO Office-Mate II Labelmaker. Thanks. I follow your blog and I’d like the DYMO Office-Mate II Labelmaker. I like the card scan mobile app that they offer! GFC follower as lewalk. I love the LabelManager ® PnP – Plug and Play LabelMaker for PC or Mac ® on the Dymo site. How cool. I am such a school supply type nerd. I love things like this. lol. Follow OurKidsMom via Google Friend Connect and I like the Home organization tapes that come in so many different great colors! Entered the MS Office giveaway. What I like about the label maker is you can get different color labels, plus it will help me organize my homeschool. I follow OurKidsMom via google connect. I visited Dymo’s website and I would love to have the DYMO Desktop Mailing Solution Twin Turbo LabelWriter & Scale. I think it is well worth the price not to have to make a trek to the Post Office and stand in that long line every time I need to buy stamps. I entered the Thomas Wobbly Wheels & Whistles DVD giveaway. I visited Dymo’s site & I like the fact the label maker is PORTABLE! I follow you by google friends connect and I also like the The DYMO LetraTag Plus LT-100T because you can make magnetic labels for file cabinets and magnetic boards. I entered the Spira footwear giveaway. I like the DYMO LabelWriter 450 Twin Turbo Dual Roll Label and Postage Printer. I follow Ourkidsmom via google friend connect. I like how easy it looks to use it. DYMO LabelWriter 450 Twin Turbo Dual Roll Label and Postage Printer for PC looks good. Thanks. I like that you can see the graphics before you print it. Follow on GFC. I learned that they have pastel Embossing Labels. I also like the DYMO LetraTag Plus LT 100T Personal Label Maker. I am a fan of DYMO via Facebook as Jill Myrick. I have already done my mandatory entries for all your giveaways. I was trying to make sure I had at least one entry into them in case I didn’t get a chance to come back. I am finally off work for a day and am catching up. I like the CardScan Blackberry Connector! GFC follower & I like their DYMO by Pelouze 5 lb. USB Postal Scale. Thanks! I like the DYMO LabelWriter 450 Twin Turbo Dual Roll Label and Postage Printer for PC and Mac® SKU: 1752266. I follow on GFC and like the DYMO LetraTag® Plus LT-100H – Personal Label Maker! I like the DYMO Caption Maker because you can use different fonts to jazz up your labels. DYMO Organizer Xpress Embossing Label Maker looks good. We’re moving soon and I’d LOVE to try the DYMO LabelManager® 210D – All-Purpose Label Maker with Large Graphical Display. I follow you on google friend connect, and thought it was really cool that they had a stamp/postage maker! I subscribe to your rss feed!! I am a follower and i LOVE their selection of postal scales! I ‘like’ OurKidsMom on Facebook. Tweeted today. ANd voted for you. Duh, guess I should have told you what I needed to here instead of a reply to my other comment. So sorry again. Thanks for the giveaway…we like DYMO’s LabelWriter 450 Twin Turbo Dual Roll Label and Postage Printer for PC and Mac. I follow on Google Friend Connect and I like the Dymo Labelwriter 450!!! I follow and I like the Label Printers as well.